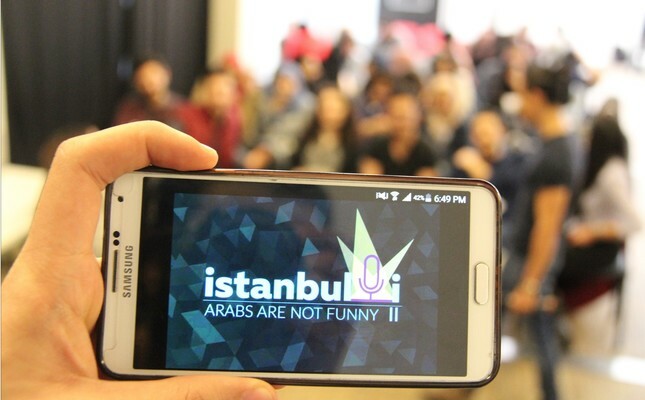 Over 100 people gathered in the in Damdayız Studio in Istanbul on Friday night to watch young people from various backgrounds perform stand-up comedy routines, proving that laughter truly is a universal language. "When I tell people that I am from Syria, I can see the sadness in their eyes, and they don't quite know how to react. Then, I tell them that I am a medical student, and they really start to feel bad for me," Bisher Alhasan from Aleppo told the audience during the second installment of the "Arabs Are Not Funny" comedy night. Alhasan is one of nine comedians who performed at the event, which raises funds for the Istanbul-based volunteer and social impact organization, Istanbul&I. Friday night's performance yielded TL 1,300 ($350) in donations, much of which will go toward youth initiatives. Ahmed Al-Shaibani, a member of Istanbul&I from Yemen, had been asking the organization to set up a charity comedy night for several months when he learned about an "Arabs Are Not Funny" comedy show in England, setting into motion plans for a Turkey-based version of the event. "I wanted to help create a platform for new comedians, but one that would specifically include a diverse range of voices. And fundraising for our volunteer group was a big motivation," Al- Shaibani told Daily Sabah. Stressing that diverse representation is part of what makes the show unique, Al-Shaibani said, "The name 'Arabs Are Not Funny' is provocative on its own, so we attract people who are not only interested in comedy, but also who are curious about Arabs taking the stage in the stand-up arena, given the fact that there isn't much representation in the field." Friday night's show began with a short skit featuring a special guest appearance by Istanbul&I's founder, Teymour Ashkan, and then moved on to the stand-up routines. Al- Shaibani served as the MC for the evening, adding humorous commentary between the acts and ensuring seamless transitions. Sarah Khalbuss, an American teacher born to Syrian parents, expressed that the event was important because it made people laugh about sometimes-difficult subjects. "Arabs Are not Funny takes topics that can be challenging given the current climate and attempts to turn them upside down. I hope that the audience is able to challenge stereotypes and actually see the similarities between Arabs, Turks, and all other people," she said. Stressing the fundraising aspect of Arabs Are Not Funny, Khalbuss added, "This comedy night is our group's first attempt at fundraising. What's amazing about it is that most of us have no comedy experience. Istanbul&I prides itself on its ability to perform as a social impact group without relying on funds. We prefer to rely on our skills. Many of us had to learn a new skill, standup comedy, and how to set up an event and collect donations to further our impact." Karim Zeidan, one of the performers from Lebanon, poked fun at his home country during his routine, but stressed that despite cultural differences, the comedians could relate to the audience on a human level. "Arabs Are Not Funny incorporates performers from a wide range of ethnic backgrounds, but each one has the experience of living as a foreigner in Turkey. Throughout the performances, the audience is able to continue learning about what other people go through and how they react to incidents, perceive matters, and above all prove that they are actually funny," Zeidan said. Adding to this sentiment, Omar Mohmmad from Syria said that the event endeavored to showcase how Muslims or Middle Easterners have a sense of humor despite the amount of war, violence, and stereotypes, which have made many move away from comedy. "Each person has their own story to tell with a struggle behind it. But above all, they are able to share these experiences with a sense of humor. That's what we want the audience to take from the show. We want them to see that many of us are Muslims from the Middle East, but we are all human and like to joke about our culture, backgrounds, and families," Mohmmad said. The jokes that stood out during the evening and received the most laughs tended to be ones that described the realities of living in Istanbul as a young person, or jokes about real-life situations. When asked about the future of the event, MC Al- Shaibani said, "I'm hoping to make this a big event in Istanbul. That means bigger venues, more material, more laughs, and of course more donations going to important causes." Expressing that he hoped to diversify the line-up with other types of acts, Al- Shaibani said, "We want to add different forms of entertainment like rap or comedy sketches, and eventually dance performances. Those are some preliminary ideas but at this point we are committed to keeping comedy at the heart of the show." While the group is still in the beginning stages of getting the event off the ground, the comedians at Friday's performance proved that Arabs are not funny... they are hilarious.